The following are a collection of posts for German news outlets on the the Love Parade Trial. We are using Google Translate to convert to English, but including the original media link. We will endeavour to update this as often as possible. Adolf Sauerland, former Lord Mayor of Duisburg, was sharply criticized on Monday for his testimony in the Love Parade trial. He revealed a “strange understanding of responsibility”. Because of his behavior after the Love Parade disaster Duisburg’s former mayor was criticized in the process. The lawyer of a defendant described it as a “true scandal of this disaster”. In the Love Parade trial, the Attorney General and lawyers have sharply criticized the former mayor of Duisburg, Adolf Sauerland (CDU), for his testimony. Sauerland had rejected all responsibility for the disaster and denied mistakes of the city administration in the approval of the Techno-Fest. Sauerland has shown “a strange understanding of responsibility,” said prosecutor Uwe Mühlhoff. It is worth noting how he disclaims any responsibility for content. His claim that the administration made no mistakes was “incomprehensible.” A co-plaintiff attorney said Sauerland had violated its duty to monitor by inaction. In the Love Parade on July 24, 2010 in Duisburg 21 people died in the crush, at least 652 were injured. The process of responsibility for employees of the city of Duisburg and the organizer Lopavent had begun in December. The prosecution accuses them of, among other things, negligent homicide. The CDU politician Sauerland had come after the tragedy in the criticism because he did not want to take the political responsibility for the disaster and hours later announced that it was not the security concept. In February 2012, the Duisburg elected him in a referendum by a large majority. In the Love Parade process Rainer Schaller testified as a witness. The organizer of the techno party took the moral responsibility and went to bereaved. Real enlightenment he did not deliver. On this Tuesday morning in front of the Düsseldorf Congress Center, where since December the process of the accident on July 24, 2010 in Duisburg, he speaks just these words in the cameras, before he disappears without further explanation in the converted to the courtroom exhibition hall. Rainer Schaller appears elegant in a black suit and a black shirt. As was the case even after the catastrophe, when pictures of the fitness entrepreneur from Berlin went around the world, the head is bare, around the mouth down to the chin is still the well-trimmed beard, the seven and a half years after the disaster probably a bit grayer has become. Schaller is the boss of Lopavent GmbH, which had organized the Love Parade in Duisburg. Like the mayor of Duisburg, Adolf Sauerland, Schaller is not sitting in the dock, but is now being heard as a witness for three days. The two-day interrogation Sauerland had brought any knowledge, except that he feels for the mass panic with 21 dead and hundreds injured not responsible. For relatives and victims the emotionless appearance was a disappointment. An apology demanded by the sideline had expressly rejected Sauerland. Schaller may have thoroughly studied the sometimes devastating coverage of Sauerland’s performance. The same should not happen to him as a media professional. “The worst thing there is is a negative press,” the 49-year-old fitness chain owner will say during the trial. It sounds like a credo. Even before the start of the 31st day of the trial, he shakes hands with some of his relatives, surrounded by cameras. He then asks the court to read a statement. Actually, he wanted to get up and look at the co-plaintiffs. But since the microphone and cameras are permanently installed, he has to sit and look forward. He pulls out a folded note from the inside pocket of his black jacket. “I would like to extend my sincere condolences to the bereaved and sincerely apologize,” he says. “All the suffering you felt and experienced since the Love Parade in Duisburg happened at my event.” It is therefore natural that “I take the moral responsibility”. He now wants to help clear things up. Schaller was to quench this hope pretty quickly. Whether he or his company would have made mistakes in planning the Love Parade, Judge Mario Plein wants to know. Schaller shakes his head. For weeks he sat together with his team, analyzed videos, but found nothing. “I kept asking, what did we do wrong, but I did not get any mistakes,” says Schaller. “Was it also discussed if someone else made mistakes?” Asks Plein. Schaller thinks and talks about the police, which had formed a chain on the ramp behind the tunnel. Although Schaller is well prepared, the judge’s questions about the details of the Lopavent organizational structure are causing him problems. Schaller increasingly falls into the Sauerland mode: Of the important decisions he knew nothing. Although he was the boss of the company, but not the person in charge of planning. For this he had his husband: Kersten Sattler, the “Head of Organization”, who, together with three former Lopavent colleagues and six employees of the city of Duisburg, has to answer for 21 cases, among other things for negligent homicide. For Sattler, all threads had come together, he had communicated with the city, he had made personnel decisions and, moreover, allowed quite freely on the budget, according to Schaller. But as with Sauerland, the chairman increases the pressure on the witness. He presents Schaller an organizational chart from March 2010. The hierarchy drawing does not point out Sattler as the central Lopavent decision maker in the implementation of the Love Parade, but Schaller. The native Bamberger, who was trained as a tradesman at Edeka and then laid a considerable career as a discount muscle maker, looks confused. Then he raises a serious charge against his ex-employee, with whom he broke after the disaster. Already at that time, after the accident, he had been told that Sattler had commissioned a colleague to manipulate an organigram to Schaller’s disadvantage. It is not unlikely that the document shown could be just that forgery. The judge gives him an opinion that Sattler’s attorneys presented to the investigative authorities in May 2013. In it, the defendant describes his former boss as a control freak. Nothing was decided then without Schaller’s consent. Everything, even planning details, had wandered over his desk for a nod. Schaller has always reserved the last word. He even wanted to engage pop star Kylie Minogue for the Love Parade, which ultimately failed due to his own budget expectations. Schaller rejects the allegations. That he was the one who finally decided everything “is not right”. Schaller is still being interviewed for two days. Then he will be able to devote himself entirely to his new visions for the Ruhr. In early 2020 Schaller wants to open the largest fitness center in the world without monthly membership fees in Oberhausen. Organizer Rainer Schaller appears as a witness in the Loveparade trial. He admits a “moral responsibility” – and apologizes to the relatives of the victims. Schaller testified on Tuesday as a witness. Because the district court Duisburg wants to clarify in a large procedure, how it came to the crowd at the Loveparade in Duisburg. At that time 21 people died in a crowd at the only entrance and exit of the area; over 650 visitors were injured. Fences had blocked a ramp to the site, the organizer should have increased the allowed number of visitors at short notice. Ten defendants must now face court action for negligent homicide and negligence: six city employees and four employees of Schaller’s Lopavent. The founder asserts that, while he was the representative “face of the Love Parade”, he did leave important decisions to his employees. After the accident, he had stayed in Duisburg for a long time, had looked with his staff “over and over again” the camera shots from the pedestrian tunnel and the visitor lock. “Of course we tried to find out what happened.” He had asked his employees all the questions that the public had addressed to him: was the Lopavent austerity program at the expense of security? Did the company overlook the threat of overcrowding? “I did not get any mistakes here,” says Schaller. “I have not heard anything.” Several times Schaller emphasizes that his local employees had the most conversations with the authorities. “I myself was very seldom in Duisburg,” says the entrepreneur. To many mails and meetings to the Loveparade 2010 he can not remember after own Kundtun. The retailer Schaller began his career as Managing Director of several supermarkets. In 1997, the Franke opened a first McFit studio in Würzburg. Since the catastrophe in Duisburg he organizes no Love Parade anymore. Schaller also does not want to pass on the naming rights. The story of the festival ends in July 2010. And the court has to make its judgment by July 2020 at the latest – otherwise the case threatens to become statute-barred. | 02.05.2018 | 03:29 Min. | Available until 02.05.2019 | WDRAm July 24, 2010, the catastrophe occurred at the Loveparade in Duisburg. The then mayor, Adolf Sauerland, will testify on Wednesday (02.05.2018) as a witness in court. Some would have liked to see him in the dock: The former mayor of Duisburg Adolf Sauerland had on Wednesday in the witness stand. His statements astonished the judge. Dusseldorf (dpa) – The Duisburg ex-Lord Mayor Adolf Sauerland (CDU) has not been involved in his own words to any errors in the approval of the Love Parade 2010. His spokesman had already attended meetings, said Sauerland. Otherwise departmental director Wolfgang Rabe informed him about the course of events. “There were frictions here and there in the planning phase,” reported Sauerland. These had been clarified by the department heads. About the approval of the Loveparade one week before the big event, he was informed by SMS on his holiday in the mountains. From this he concluded that all concerns could have been dispelled. In one point he had become active, admitted Sauerland: The then Duisburg police chief had previously expressed negative about the Love Parade and held this in Duisburg for impracticable. He then asked the administration to examine its concerns, Sauerland said. He assumed that this had happened, but in concrete terms he knew nothing about it. He personally was not a big friend of the Love Parade, said Sauerland. “The Loveparade was tendered to us by the KVR (Kommunalverband Ruhr, d. Red),” he said. Initially, no space was found, but then the company Aurelis offered the former freight yard site, the “Duisburger Freiheit”. At the Love Parade on 24 July 2010 in Duisburg 21 people died in the crush, at least 652 were injured. The process of responsibility for six employees of the city of Duisburg and four employees of the organizer Lopavent had begun in December. The prosecution accuses them of, among other things, negligent homicide. Due to lack of space, the process takes place in a congress hall in Dusseldorf. Duisburg. His appearance was eagerly awaited: Duisburg ex-mayor Adolf Sauerland (62) testified today as a witness to the Loveparade trial – and revealed little surprising. Professionally, without great emotions and with a calm, objective voice Sauerland said. When asked by Judge Mario Plein after his participation, Sauerland replied: “I was not active in the approval process! I was contact person for outside, but actively not active, “says Sauerland. “The whole thing was about the subject matter and that’s where it belonged,” says Sauerland. For the coordination, Secretary of the Department Wolfgang Rabe was his contact. He only told him. Only later, then, the planning department Jürgen Dressler came to it. After the catastrophe on the Duisburg Love Parade, the Lord Mayor had long rejected responsibility. Now he had to testify in the process. “This can be a really important day of negotiations,” says Julius Reiter, on Wednesday morning in the large conference room of the Messe Düsseldorf Congress Center. Since the beginning of December there is the criminal process for the Love Parade disaster, because there is not enough room in the Duisburg district court for the mammoth procedure. At the techno-spectacle Love Parade, on July 24, eight years ago, 21 young people were killed on the much too narrow access ramp to the former freight yard in Duisburg, more than 600 people were injured. Because of negligent homicide and negligence have since the beginning of December six employees of the Duisburg Building Inspectorate responsible because the authority despite detailed documented safety concerns had granted the approval for the mass event, and four employees of the private operator company Lopavent the gym operator Rainer Schaller. Schaller himself, like the Duisburg Mayor Adolf Sauerland (CDU), was never one of the accused. For many victims and survivors, this is a big disappointment. As witnesses, however, Sauerland and Schaller now have to be questioned at length in the main hearing by the 6th Grand Criminal Court of the Duisburg Regional Court. “Many of my 100 clients have been waiting for this,” says Opferanwalt Reiter. Next to him is Paco Zapater and nods. Zapater lost his daughter Clara during the Love Parade disaster. On his lapel he wears a badge with a portrait of her. Again and again he travels with his wife Nuria Caminal from Spain to participate in the process. On Wednesday he wanted to “look in the eyes” Sauerland. Zapter and his wife see in Sauerland “the main responsible person”. hr lawyer Reiter, however, is convinced that Sauerland was “no driver” for the event. But even if Sauerland is not guilty of German criminal law, he has the political and moral responsibility to take over, Reiter believes. Like no other, the Lord Mayor has become a symbol of catastrophe. “And that’s why Sauerland will certainly ask the court to turn to the victims and the bereaved at the beginning of his testimony with a statement,” says Reiter as Sauerland enters the hall. In addition, the former Mayor of Duisburg must finally talk plainly about “why the event, which should never have taken place, yet took place”. Some would have liked to see him in the dock: The former mayor of Duisburg Adolf Sauerland had on Wednesday in the witness stand. His statements left the court skeptical. His spokesman had already attended meetings, said Sauerland. Otherwise departmental director Wolfgang Rabe informed him about the course of events. “There were some frictions here and there in the planning phase,” reported Sauerland. These had been clarified by the department heads. About the approval of the Loveparade one week before the big event, he was informed by SMS on his holiday in the mountains. From this he concluded that all concerns could have been dispelled. He personally was not a big friend of the Love Parade, said Sauerland. “The Loveparade has been tendered to us by the KVR (Kommunalverband Ruhr, d. Red),” he said. Initially, no space was found, but then the company Aurelis offered the former freight yard site, the “Duisburg freedom”. Duisburg’s ex-mayor testified as a witness in court. He had the idea to apply for the Love Parade, but had nothing to do with the permit. He had the idea to apply for the Love Parade, contributed to the City Council, said Sauerland. The Council approved by a large majority. Otherwise, he had not been involved: “That was then a matter of professionalism.” His spokesman had ever attended meetings, otherwise departmental Wolfgang Rabe informed him about the state of affairs. At the Love Parade on 24 July 2010 in Duisburg 21 people died in the crush, at least 652 were injured. The trial against six employees of the city of Duisburg and four employees of the organizer Lopavent had begun in December. The prosecution accuses them of, among other things, negligent homicide. Sauerland is not one of the defendants. Former Lord Mayor Adolf Sauerland testifies in the trial for the Love Parade disaster in 2010 in Duisburg. At that time 21 people were killed, already in the run-up there had been safety concerns regarding the big event. Sauerland rejects any guilt that it was not active in the approval process. Lawyers usually talk objectively, in their brittle language a man like Adolf Sauerland embodies “an unproductive evidence”. A useless witness, then. Duisburg’s former mayor spent more than six hours in court on Wednesday, and Mario Plein, presiding judge of the 6th Grand Criminal Court, asks him again and again how “that happened then”. Back in 2010, when the Town Hall, where Sauerland ruled, approved the Loveparade. Sauerland squats in front of him at a white Resopaltisch, keeps his hands folded, looks wide-eyed into space – and says nothing. 21 people died that day in the crush on the former Duisburg freight station, more than 650 suffered some serious injuries. For many of them, Sauerland, the city’s first man, would not have been on the witness stand, but on the dock. There are now six municipal employees, once Sauerland’s subordinates, as well as four employees of the organizer “Lopavent”. Sauerland feels innocent, in the sense of criminal law anyway. The questionable permission for the Love Parade, which was the parade of suffering, he had not granted: “I was not active in the approval process,” he says very generally in the beginning clear, “I did not have to issue or prepare.” Demands for details encountered the ex-OB with amazing ignorance. For which one employee in the building office, today one of the ten defendants, was exactly responsible – “I do not know that”. In 2009, as building safety doubts and security concerns against the mass event emerged, Sauerland did not interfere with his own statement: “That was then a matter of professionalism.” In case of doubt, the former Town Hall director refers to his former departmental director Wolfgang R .: “As far as I remember, everything went over Mr. R.” R. will soon appear in court. As a witness, for a charge of negligent homicide, the chain of evidence was not enough. Stoisch Sauerland sits there, the questions are pouring at him. Richter Plein loses his patience once with the witness who, as an ex-OB, did not notice so much: “We are not talking about the flea market in Duisburg-Marxloh, we are talking about the Love Parade.” Sauerland remains unmoved, even as Plein annoyed embarrassed: “Little Erna would say that’s all weird.” Although Sauerland was well aware that his chief of the department of the town hall was against the Love Parade. But he did not ask. Not even when in 2009 the then Duisburg police chief Rolf Cebin warned keenly against the dangers of the techno crowd casserole. His letter he had “passed for review” in the belly of the administration, says Sauerland, “such a letter is processed.” Without resubmission. “Mr. Sauerland was the symbol of the city, as we had already expected an explanation,” says Julius Reiter, a lawyer of the co-claim. His reprinting was “embarrassing”. His client Paco Zapater is even more apparent. “Sauerland acts as if he had never been mayor, but only a small steward.” Responsibility bore others. The useless witness, for Paco Zapater since Wednesday he is a “tonto útil” – a useful idiot. Adolf Sauerland’s treatment of the Love Parade disaster in Duisburg was heavily criticized – and eventually led to his resignation as Lord Mayor. Now he is interviewed as a witness. In the Love Parade trial, the former Mayor of Duisburg, Adolf Sauerland, will testify on Wednesday for the first time. His handling of the disaster had cost him his office. Originally, his statement was already scheduled for April 27. However, because that day prevented a chief pastor from death, the statement was postponed. In the Love Parade on July 24, 2010 in Duisburg 21 people died in the crush, at least 652 were injured. CDU politician Sauerland came as Lord Mayor after the deadly mass panic massively in the criticism, because he did not want to take over the political responsibility for the disaster. In February 2012, the Duisburg voted in a referendum by a large majority for his election. The local politician, who was Lord Mayor since 2004, then withdrew largely from the public. The former vocational school teacher came in 2004 surprisingly in the long SPD-dominated industrial city to power. He also brought in the opinion of critics fresh breeze in the city and progress in structural change – such as the development of the Duisburg inner harbor. In the hardest hours as head of the city after the Love Parade with 21 dead but he failed after general assessment but. In the criminal proceedings for the Duisburg Love Parade disaster of 2010 occurs on Wednesday (02.05.2018, from 9.30 clock), the former mayor of Duisburg Adolf Sauerland (CDU) as a witness. If the time for the survey is insufficient, Sauerland is expected again in the courtroom in Messe Düsseldorf on 3 May. Surprisingly won the Christian Democrat Adolf Sauerland in 2004, the mayor election in the “red” Duisburg. The teacher was considered close to the people and down to earth. The new OB wrote the budget restructuring and structural change on the flags. Until the Loveparade 2010 Sauerland was something of a showcase local politician of the CDU in North Rhine-Westphalia. One day after the deadly catastrophe, Sauerland looked visibly stunted and nervous at a press conference. The PK became for him to gauntlet. He personally was not involved in the planning, said Sauerland. This attitude continues to shape his public image: a politician who dismisses and takes no responsibility. In the legal process, the 62-year-old was actually not accused. The CDU politician came as an OB after the mass panic 2010 massively in the criticism. Calls for his resignation increased. But Sauerland remained in office. In early 2012, he was then voted out by the citizens. “I’ll have to live with that,” Sauerland said disappointed and retired from politics. The presiding judge Mario Plein placed the ex-OB at the top of the list of “celebrity” witnesses – even before Loveparade organizer Rainer Schaller. Whether this prominent role leads to Sauerland announcing something new before the Duisburg district court remains to be seen. It is eagerly awaited whether he will burden individual persons with new insider details. Among other things, the trial is directed against six employees of the city of Duisburg. Survivors of the 21 fatalities and survivors are likely to listen carefully to whether Sauerland apologizes in the witness stand for his political responsibility – or finds other words of regret. The Loveparade trial is one of the biggest criminal trials in history. What does the mammoth procedure cost and who pays for it? An invoice. Since the tragic events of July 24, 2010, what was planned before the Loveparade and happened that day, several investigators and lawyers. There are 32 defense lawyers, around 150 process participants and so far 111 scheduled main trial days. Until there is a judgment in the mammoth procedure (if any), it will cost millions. 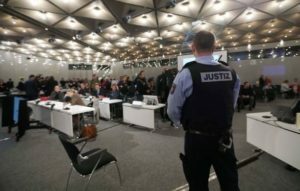 The courtroom: Since the rooms in the district court of Duisburg are not big enough for the approximately 150 participants in the proceedings, the court has rented a hall in the Congress Center of the Düsseldorf Trade Fair. That costs 14,000 euros rent – per negotiation day. In addition, the court had expected a high public interest. Except for the first days of the process, the 150 spectators and 50 press seats were mostly empty. This should only change again when prominent witnesses are heard by the court, such as at the time of the Love Parade acting Duisburg Lord Mayor Adolf Sauerland, Lopavent boss Rainer Schaller and the then Interior Minister Ralf Jäger. The bottom line is that alone for the year 2018 makes around 1.5 million euros. The staff: The NRW Ministry of Justice estimates that the staff costs for the process alone will be around 1.7 million euros. 42 posts were created specifically. Two additional prosecutors were recruited, plus 30 sergeants and ten office staff, including secretary-general. They should switch to vacancies in state justice after completing the Loveparade procedure. The defense: For the employees of the Duisburg city administration, who are indicted in the proceedings or those who were considered as accused for a while, the city carries the fees of the defense lawyers. And according to the research of our editors, they are at an hourly rate of around 300 euros. A very common set for renowned defense lawyers who have experience in complex large-scale proceedings. By the end of 2017, the city of Duisburg had cost these expenses in the Loveparade process around 5 million euros. This includes the fees for the legal counsel of the city witnesses, who had to testify in the proceedings and will probably be heard in court. And since the process has just begun, rather higher costs are expected. In 2018 alone, 111 meeting days have been scheduled so far, at which the full hourly rate will be due. In addition, the process must be prepared on an ongoing basis. An example: Only the first part of the new Loveparade expert opinion of the traffic safety expert Jürgen Gerlach is around 2000 pages strong, in addition, later comes to a scale of the same magnitude, which deals with the events on the day itself unhappy. This opinion must be read by the lawyers, discussed with their clients and also adapted to the process strategy. That eats time and time in the case is money in the truest sense of the word. If a first-instance verdict in the criminal proceedings takes place no later than 2020, this is most likely not the end. It is almost expected that other courts will deal with the events around the Love Parade. The defenders have not been in vain at the start of the trial with their bias motions and occupation calls to see that they may be a revision. And even if a final verdict is present, further civil litigation of today’s or future co-plaintiff may follow. An end to the legal dispute can therefore not be seen for several years. Why the city can only estimate the costs that are still to come, explained a spokesman for the city administration at the request of our editors. Nevertheless, the city chamber has to calculate roughly. And so in the context of the Loveparade in the 2018 budget, “costs of 3.2 million euros have been estimated.” A prognosis: If one extrapolates this up to the last possible criminal trial end of mid-2020, the legal costs alone during the process would amount to at least 8 million euros. By the way, the legal fees of the four Lopavent employees are unknown. But here, too, renowned law firms are in action who already have experience in large criminal proceedings. It can be assumed that these are therefore located in similar regions as in the legal representation of the six urban defendants. Who bears what costs? This depends on the outcome of the entire procedure, this is regulated in the cost law. If the court ultimately determines the individual guilt of the defendants and condemns them, the defendants must pay the costs. In the case of an acquittal, this is borne by the state. In the context of the Loveparade case, the costs of the co-plaintiffs, explains spokesman for the Duisburg district court, Matthias Breidenstein: “The defendants must carry their necessary expenses in principle, if they are convicted of the offense affecting the co-plaintiff , If the defendants are acquitted, the co-plaintiffs in principle bear their own costs. This is basically the case when the proceedings are terminated. However, the rental costs for the convention center should not be borne by the defendants or subsidiary plaintiffs, because they are not subject to the legal costs, the court spokesman said. The rent then carries the state treasury. The city of Duisburg can also reclaim the costs of defense from its employees. Since 2008, there is a corresponding decree of the Ministry of the Interior and Finance, which regulates the procedure. In it, the provisional reimbursement of costs is regulated by the employer, “provided that a free legal protection can not be obtained and there is a professional interest in the legal defense.” That would also be the case in the Duisburg Loveparade proceedings. Incidentally, the fact that the city administration protects itself from its employees in the proceedings is common practice. A demand from our editorial staff at several NRW municipalities confirmed that the cities act as a duty of care for their employees. Nevertheless, not a few civil servants in the public sector additionally secure themselves privately with so-called “official liability insurance”, because civil servants and employees, unlike normal employees, are not protected by their employer against a risk in the occupational sector. In the case of a conviction, the advance for the defense would have to be repaid by the employees, it says further in the decree. Could the city of Duisburg have legal protection insurance? Conclusion: The exact costs that are associated with the Loveparade trial can not be estimated until the final verdict. However, if you add together the already known items, this amount is already around 11 million euros. In addition, the cost of representing the co-plaintiffs and the four Lopavent employees will certainly never become public. It is likely that the whole process will cost approximately 20 million euros, if not more. Then it would have been serious for Duisburg ex-mayor Adolf Sauerland (62) in the Loveparade trial in Dusseldorf. Because exactly 2864 days after the Love Parade disaster in 2010 with 21 dead and over 600 injured, he would have been heard in the process of legal processing of the disaster as a witness. The reason for the Temrin cancellation: a death in the family of a judge. But deferred is not suspended. Sauerland should testify instead on May 2 and 3. Duisburg. Because a chief secretary is prevented, the former mayor of the city of Duisburg will not testify next Friday in the process of the Duisburg Love Parade disaster. The beginning of the hearing of the former Lord Mayor of the city of Duisburg, Adolf Sauerland, moved by a few days. This was announced by the district court of Duisburg. Sauerland will now testify on May 2 and 3 from 9.30 clock. Reason for the shift is a death in the family of the Schöffin. Adolf Sauerland is not one of the defendants, because he was not directly involved in the planning of the Loveparade 2010. He had had to vacate his chair after a referendum, because he was accused that he would not have had to assume the legal, but the moral responsibility for the misfortune. Friday will be serious for Duisburg ex-OB Adolf Sauerland (62). Exactly 2864 days after the Love Parade disaster in 2010 with 21 dead and over 600 injured, he has to testify in the process of the legal processing of the disaster. Accused are six employees of the city and four employees of the organizer. Allegation: negligent homicide. At the Loveparade in Duisburg 21 people were killed. How it came to the failure of the administration, investigates a research group to political scientist Wolfgang Seibel. Professor Seibel, with some students you scientifically examined the Loveparade 2010 in Duisburg and wrote a book. 21 people were killed at that time. Would the disaster have been avoidable? It was definitely avoidable. The event had a long lead, it had to be planned and approved first. The Building Regulations Office in Duisburg said in no uncertain terms that the statutory safety regulations could not be complied with on the planned site. But the decision-makers at the top of the city administration ignored it. Why was the Love Parade then approved? Pressure was exerted on the members of the Building Authority, in particular by the decision-makers at the head of the city administration, so that they granted the permission, as it were, grudgingly. Although the private organizer had admitted that the escape routes had only one third of the statutory minimum width. Then that was a catastrophe with announcement? In any case. But you have to differentiate. The approval of the Love Parade by the city of Duisburg was not only objectively unlawful, it was above all an expression of an incredible irresponsibility in dealing with risks to the lives and lives of thousands of event visitors. Of course, the failure of the authorities did not trigger the disaster automatically. Rather, this happened because the employees of the licensing authority were not allowed to monitor their own safety requirements on the day of the event, at the express instruction of their supervisors, because they clearly knew exactly that these requirements could not be met. As misjudgements of security and police came along, the situation got out of hand. Did the mayor and his deputies take responsibility for this? No, they have never done that. The OB was later voted out, two deputies were not re-elected. But that only reflects the surface. The state government of North Rhine-Westphalia and the former coalition of the SPD and Greens has never had the official failure in connection with the Love Parade disaster worked up. Apparently nobody wanted to know anything, so they did not want to learn anything. That, too, is a totally unacceptable escape from responsibility and also a particular audacity towards the survivors of the 21 deaths. Were your students and you the first to deepen your understanding of Duisburg? At the very least, our book is the first attempt to analyze the authorities’ failure, which has led to the deaths of 21 predominantly young people, resulting in 652 injuries. After all, our investigation is not criminal in nature, so that finally addresses the district court of Duisburg. We aim at organizational failure and prevention. What does that mean for the future? Can you learn something from it? The administration must under no circumstances subordinate the physical security of people to other aspects, in particular non-political considerations, as was the case in Duisburg, but also not economic or financial motives. Normally the administration does not do that either. However, it has to arm itself against political or fiscal demands that demand seemingly pragmatic solutions in which the lives and lives of others can be endangered. What is the situation in Baden-Württemberg? Have you already dealt with administrative failures in this federal state? No, not so far. There is the case of abuse in Staufen. The process is serious because the youth welfare office knew. Nevertheless, the boy could be offered by his own mother in the Internet market. A custody of the youth welfare office was available, but the court has lifted them. This too must be worked through completely, just for the purpose of sustainable prevention. Is that a coincidence: Again and again, youth welfare offices get into the field of fire – whether justified or not. Are you following this? The youth welfare offices work conscientiously. After all, they are dealing with children, especially vulnerable people. But there is a shortage of staff, especially with sufficiently experienced staff. Because the protection of the child’s well-being is often about difficult balancing problems. The inhibition to take a child out of the family to protect it seems to be particularly high. And then it comes to tragic misjudgments. Unfortunately, Staufen is not an isolated case. In Bremen and Hamburg there were deaths of infants, because the youth welfare offices had just failed in this area. By the way, we also examined one of these tragic cases in our book. Wolfgang Seibe l, 64, teaches administrative science at the University of Konstanz. Among other things, he conducted research on the Holocaust or administrative construction in the (then) new federal states. Aachen. In the Munich NSU trial, a lawyer is said to have represented a nonexistent victim. Now he is charged in Aachen for fraud in a particularly serious case. He is said to have cheated in the Loveparade trial. This explained the district court Aachen on Wednesday. The lawyer had therefore for years represented before the Munich Higher Regional Court an alleged victim of the nail bomb attack in the Cologne Keupstraße as a co-plaintiff. For this he should have collected 211,000 euros in meeting and travel expenses. Previously, “Focus Online” reported. In addition, the lawyer is being charged with an oath in connection with the deadly Loveparade disaster trial for forgery of documents and incitement to false insurance. With false information on the health of his client, he had wanted to gain access as a suffrage representative. He is said to have persuaded another victim to issue him with a blank proxy, which he then allegedly shot over to a colleague. Ralph W. was represented in the NSU trial before the Higher Regional Court for two and a half years Meral Keskin, who had been injured in A plot in front of a hairdressing salon at cologne’s 2004 keup street should. In October 2015 it became known: The woman does not exist at all. What is charged with fraud in a serious case? That explained on Thursday (29.03.2018) the regional court Aachen. By the end of October, the lawyer has been asked to repay the money. Whether he has done this in the meantime is unclear. W’s attorney Peter Nickel had actually existed. Another, now defunct plaintiff in the NSU trial Keskin had invented and given him as a client to collect commission. W. had always communicated with Keskin only about this man. Actually, he is therefore the victim. “He went there for two years and had the expenses that he claimed,” said his lawyer. So, access to Loveparade process stalked? However, W is also accused in another case for falsification of documents and incitement to false insurance on oath instead: he has said to have tried to have faked with false information on the health status of a client access as a suffrage representative in the process of the deadly Love Parade disaster. He is said to have persuaded another Loveparade victim to issue him a blank clearance certificate, which he sent to a colleague. It is a criminal trial that has been publicly criticized from the beginning. Much too late comes in Duesseldorf main trial for the Duisburg Love Parade disaster of 2010, it said. Also, whether not possibly the wrong ones were accused, is hotly controversial. But at least: So far, a very intense dispute in court for the course and causes of the disaster is scarcely eight years ago with 21 dead from. Whether one of the ten defendants can be proved legal guilt seems more open than ever. While the prosecution points to planning errors in the city and the organizers, the defenders in the process have so far no opportunity to denounce mistakes of the police. Accused are four employees of the promoter Lopavent and six employees of the city of Duisburg for negligent homicide and negligent assault. On the most recent trial days, the presiding judge Mario Plein discussed with prosecutors and defense attorneys about the further witness interrogation (so far in the process mainly co-plaintiffs had been questioned). From April, “celebrities” will also be invited to the witness stand. In addition to Duisburg’s ex-OB Adolf Sauerland (CDU) and Loveparade organizer Rainer Schaller – they were often attributed a moral responsibility by survivors and relatives of the victims – also appears the former NRW Interior Minister Ralf Jäger (SPD) on a list of the most important witnesses , The preliminary list, which includes a panic researcher and administrative and police representatives, is available to the WDR. It is unclear whether one should first consult the most important 30 or even 45 witnesses. “The list is not complete yet,” said a court spokesman. The parties have comments and suggestions “which the court wishes to consider and possibly take into account”. Judge Plein said in the process that he wanted to summon Sauerland for the 27th of April and 2nd of May. It is expected that the questioning of the witnesses will take until at least the end of 2018. So far, the process is progressing very quickly: The reading of documents and first witness statements took less time than expected. The process is under time pressure: The statute of limitations of the criminal acts threatens. By 27 July 2020, ten years after the death of the 21st victim, a judgment must be given in the first instance – otherwise all the accused will go unpunished. The court has set 27 April and 2 May as deadlines. Adolf Sauerland is not one of the defendants, because he was not directly involved in the planning of the Loveparade 2010. He had had to vacate his chair after a referendum, because he was accused of not having had to assume the legal but moral responsibility for the disaster. The accident on 24 July 2010 caused 21 people to die. Most of them young: between 18 and 25 years old. They came from Germany, China, Australia, Spain, Italy and the Netherlands. In addition, more than 650 techno fans and helpers were injured in the crush, some of them seriously. Many others suffered psychological damage from the disaster. DUISBURG. The former mayor of Duisburg, Adolf Sauerland, is questioned in the Loveparade trial. The dates are fixed. Adolf Sauerland is questioned at the Loveparade trial. The Duisburg Regional Court announced on Tuesday morning that the interrogation of the former Lord Mayor of the city of Duisburg, which was in office in 2010, is scheduled for 27 April and 2 May in the Loveparade criminal case. A Monday morning in the Easter holidays. On this trial day, the visitor and press areas in the courtroom are still a bit emptier than usual. The session begins with the questioning of Essen-based forensic lawyer Kurt Trübner. He had after the disaster on 24 July 2010, two female victims of obstructed. Like his colleagues on the last few days of the trial, Trübner describes in all details external and internal injuries. Trübner calls in both deaths “chest compression” as the cause. In the crowd, the two young women did not get more air. In the first case, the woman was declared dead by an ambulance at the place of the accident. The second victim examined by Trübner had died four days later in the hospital. The doctors could not save the woman. The presiding judge Mario Plein then continues swiftly. Important documents have yet to be introduced into the negotiation – that is, to be read: among other things, the security concept of the organizers and operational plans of the police, which were then sent to the fire department in advance. Also more surveillance videos are presented in court. They show the deadly crush on the ramp to the techno event. After each piece of evidence, prosecutors and defense have the opportunity to comment. Not for the first time opinions differ widely: The prosecution sees through the documents their allegation confirmed, those responsible at the city of Duisburg and the organizer Lopavent had planned wrongly. Defenders value documents and videos quite differently: the police, who are not in the dock, have made mistakes. At the very end of the session, Presiding Judge Plein will address the future witness hearings. Not even all co-plaintiffs have been questioned yet. In addition, 30 very important witnesses have been identified as of today. As you progress quickly, the further surveys are planned. Plein proposes to the other participants in the process that they summon as prominent witnesses – presumably for April 27 and May 2 – the mayor of Duisburg, Adolf Sauerland (CDU). After Loveparade organizer Rainer Schaller is in the witness stand. With witness hearings, the court is likely to be employed until the end of 2018. If possible, do not want to show pictures, says the presiding judge Mario Plein. But he asks the two forensic doctors for precise descriptions. They are sitting here because in July 2010 they have autopsied the bodies of two Loveparade victims. Both wrote the “diagnosis of suffocation in massive chest compression” in their reports. Schubries and his colleague dr. Andreas Freislederer describes precisely both externally visible and internal injuries – some intimate physical details. Both present their results soberly, for them such studies are part of everyday working life. For the audience, on the other hand, the descriptions create difficult-to-process images in the mind. It is understandable that today no co-plaintiffs have come into the courtroom. After an hour, the forensic doctors are done, apparently much faster than planned. Short break. The court wants to advise how the day of the hearing goes on. The second part of the trial day is much less emotional. Plein and his colleague read different documents in turn, starting with an event description by the company Lopavent from 16.07.2010. The information on expected flows of visitors, access controls and escape routes that appear here will certainly play a role in the process. Also read is a framework agreement between the city and the organizer, as well as minutes of the city council. At the end of the day, the court shows part of a silent video on the two big screens. Silence in the courtroom. For a half hour, camera 13 reveals a view of the ramp – uncut. The section shows the scenery from 13:27 clock: Even if building fences narrow the ramp, the visitors stroll comfortably on the grounds. Some men urinate on walls, a bottle collector stands next to his garbage bag. At 13:39, two party visitors jump through the picture. They look happy as they stretch their arms in the air. From mass panic is yet to feel anything at this time. But these pictures will soon have to show the court. Duisburg / Dusseldorf. The state of North Rhine-Westphalia wants to help the co-plaintiffs in the trial for the Love Parade disaster with a travel allowance to participate in the trial. For travel and accommodation costs provide the country a total of 100,000 euros available, said Social Minister Karl-Josef Laumann (CDU) on Wednesday. The subsidy can be applied for for up to ten days, the reimbursement is flat rate, graduated according to the distance. At ten negotiation days and arrival from abroad, a maximum of 1,800 euros per person can be applied for. Vouchers do not have to be submitted. More than 60 co-plaintiffs participate in the criminal proceedings before the Duisburg Regional Court. For reasons of space, the court moved the main hearing to a congress hall in Düsseldorf. More than 110 days of negotiations have already been scheduled for last December’s trial. Due to negligent homicide and negligence, six employees of the city of Duisburg and four employees of the organizer Lopavent are charged. The state government has provided another 300,000 euros for the pastoral and psychological care of the victims and relatives affected. In the misfortune on July 24, 2010 in Duisburg in the throng of the only entrance and exit of the Technoparade 21 people were crushed. At least 652 were injured, many of them seriously. “Anyone who has lived through such a tragedy must be easily supported and relieved of bureaucracy,” said Laumann. Today, the Loveparade trial continued with the witness questioning. Two young men report as co-plaintiffs about what they experienced on the day of the disaster. The special thing about the situation in the courtroom: The two 34-year-olds are twins. Next to them sits her lawyer. It is her father. The brothers are interviewed separately. He had been traveling with his twin brother to the Love Parade, one of them starts his testimony. On the way to the site he had seen only a few files and police. Again and again his voice fails and he takes longer breaks. It visibly takes him to reflect what he has experienced. Especially his descriptions from the crowd go near. “Someone broke down next to me.” People tried to climb monkeys by the lampposts. At some point he said to his twin brother: “I hope we get out of here alive.” Then they lose themselves in chaos. The versions, however, sometimes appear blurry and contradictory. This is especially evident when the judge or defense asks. Sometimes the witness does not remember correctly any previous statements or suddenly presents them differently. After nearly three hours, he is released from the witness stand. Everyone takes a deep breath. Now the other twin comes to the witness stand. He seems a little more composed and assorted. However, the closer he gets to his descriptions of mass panic, the more difficult it becomes for him. He reports on the police bulli, who pushed himself through the crowd to the ramp on the day of the catastrophe with “roaring siren”. “He took away our habitat.” There had been meters that they could have used in the crush themselves. In addition, the mood has become even more heated by the police car. He meets his brother later in the train again. What really happened on that day, they learn from the news later. In their final statement, the defense likes to pick up the statements about the police. They once again showed that the police did not provide enough support. On the contrary – “there was no real police presence at the barriers,” a defense attorney explains. The tactic behind it is clear: you may be able to relieve your own clients. The criticism of the police meanwhile runs like a red thread through the process. Only nobody sits on the dock. In the Loveparade trial, a young Dutchman testified. He lost a friend in the disaster. His descriptions shake. Policemen had looked down on the crowd without action. When he thought that he, too, was dying now, when he had lost his strength, could no longer resist the weight of the bodies above him, his limbs pushing his breath away, biting everything and pushing no longer, he heard them Melody: “Sweet Dreams” by the Eurythmics – in a techno version. Then he suddenly saw shoes, was splashed with water and someone tried to pull him out of the pile of bodies. It is absolutely quiet in the large hall of the Düsseldorf Congress Center. The 29-year-old Dutchman from Zwolle reported on Tuesday in the Loveparade trial as the first foreign witness so oppressive of his one and a half hours of struggle for survival that even his interpreter has to interrupt, sobbing and fighting with tears. It had all started so well when he drove to Duisburg with his friend Jan-Willem on that Saturday. They were looking forward to the spectacle, the weather was splendid, the people danced on roofs. But then it had become fuller and fuller on the way to the Loveparade site. Even before the lock, which was upstream of the tunnel to the site, an enormous crowd of people jammed. When an ambulance had to be let through, he and his friend had finally entered the tunnel. But soon after he had turned onto the notorious ramp, nothing was possible. The crowd has pushed him in waves to the right and left. He had lost the ground under his feet, was slowly pushed backwards and to the ground. That took several minutes. He could not have prevented it. The German next to him, Ingo, survived with a broken leg. He still had a T-shirt wrapped around, which was probably pointless. At a police station, the officials had then joked around and made fun of his bad German. “I thought that was pretty inappropriate,” said the Dutchman. According to his testimony to the police, he telephoned the mother Jan-Willems a second time and told her what he had not done the first time: “The worst phone call of my life”. She shouted that he had heard her phone drop out of her hand. Since then, he has consulted 15 doctors, psychologists and psychiatrists. He suffers from depression: “To this day I have to deal with it every day. The flashbacks never left. But now I can not see his face when he comes back in my dreams. “He was unemployed, sick. At the Loveparade disaster on 24 July 2010 in Duisburg 21 people were crushed and at least 652 injured. Among the dead were a Dutchman and an Australian. The trial of Duisburg Regional Court against six employees of the city of Duisburg and four employees of the organizer Lopavent had begun in December. The prosecution accuses them of negligent homicide. For space reasons, the process takes place in Dusseldorf. In the trial for the Duisburg Love Parade disaster on Tuesday (06.02.2018) testified for the first time a witness from the Netherlands. Above all, the 28-year-old described the narrowness of the Loveparade very impressively. One stood head to head and forehead to forehead. Then, according to his testimony, he was knocked to the ground and buried by crushed people. Next to him, he spotted his buddy and could not feel a pulse with him anymore. It was quiet as rare in the courtroom as the Dutchman testified. Even his interpreter fought – while she was translating – with tears. Also an Australian is supposed to testify in court today. A friend of hers died on the Love Parade. The hearing was interrupted because of translation problems. Dusseldorf. In the process of the Love Parade disaster in Duisburg, the first foreign witness was a Dutchman. His friend had died in the throng. He was not good at the police. The officials had denied the help of the deadly crowd and looked idly. After nearly three weeks of interruption, the Loveparade process in Düsseldorf was continued. The Dutchman is also a co-plaintiff in the proceedings. At the Loveparade disaster on 24 July 2010 in Duisburg 21 people were crushed and at least 652 injured. Among the dead were also a Dutchman and an Australian. The trial at Duisburg Regional Court against six employees of the city of Duisburg and four employees of the organizer Lopavent had begun in December. The prosecution accuses them of negligent homicide. For space reasons, the process takes place in Dusseldorf. In the Loveparade trial on Wednesday, an eyewitness described how he experienced the terrible crowding that was fatal to 21 people. The 27-year-old from Osnabrück is only the sixth witness in the trial for the Techno Festival in Duisburg, in which 21 people died. Not the first to talk about the dead, but the first to talk about a victim he knew. Eike Mogendorf, 21, one of seven friends who did not survive the trip. Like his friend, his parents are co-plaintiffs in the process, in which ten defendants have to answer for negligent homicide. The then 20-year-old has survived. With abrasions, bruises, bites, but he did it. “They are coming!”, A friend called suddenly, he was pulled out, lay motionless between the bodies, could not move his legs, felt, “like several times through the meat grinder turned”. And then he saw the girl: that girl who had rolled her eyes next to him, Eike was still there. For a long time he had tried to pull the young woman up, she was light and he was strong, “but we did not lift her up and then I did not see her”. And now she was lying there, her eyes open, her lips blue. The 27-year-old is crying. Until Patrick saw the papers, days later, he thought the ramp to the Love Parade had been their exit. The escape route. Witness: “Who had fallen, was swallowed. Dusseldorf. How was it then, on 24 July 2010 in the deadly crush of the Love Parade disaster? How could it happen that 21 young people died in Duisburg and more than 650 were injured? The Duisburg district court heard two other witnesses who were in the midst of a deadly crush on Tuesday. Unlike a young woman who testified last week in the huge courtroom in the Dusseldorf fair, Gernot B. has come out of the case without injury and without trauma. Anyway, he says that himself. And he wonders when the judge then reads him from a medical certificate, which definitely certified him a traumatization. Even for the 34-year-old software developer, who had gone to a love parade with a few friends, the matter was life-threatening. When he is only a few meters from the stairs, over which some people save themselves from the deadly crush, it is no longer back or forth. The Brunswick describes how he is completely unable to move in the tightness, the left arm down, the right above his head. And so he can not help, as next to him hyperventilated a young woman. “Then her eyes were lifeless, twisting upwards,” he says. He still tried to grab her by the arm, pull her up, but he does not make it, is himself narrowed and motionless. The last thing he sees of her is that she sinks down between the other people. He never knew what happened to her, “I suspect she died,” he says. At the latest, he realizes that the situation is deadly. “I was worried about my life but tried to keep my cool, not trying, like some others, to push myself out of the crowd.” At some point there is a push that propagates through the crowd, he and others around him getting skewed, feet still on the ground. Then, occasionally people are pulled out of the crowd, his friend Marco has fainted, “I have hit him with a flat hand in the face, he should persevere.” At some point then many helpers had been there, he could go up the stairs and later found his friends again. The second witness on this day has a different perspective: The 42-year-old Mehmet B. makes a solid impression at first glance. But in the course of the hearing comes through, as this day has thrown off track. The professional driver still takes drugs that prohibit him from using machines, driving cars. He had conversation therapies, took antidepressants, the lust for life had been lost to him. He could only help out in the drinking hall today. He blames himself on how he behaved at the time, he says. He also tells of wave movements of the mass, also for him the stairs had been like a magnet. A possible escape route. On the way he had “pushed through the crowd with a lot of physical effort”. Everyone was violent, he justifies himself, everyone wanted to save his life. Finally he reached the stairs. A young man wanted to pull him up, but then he left his strength and let go. So he was pitched down. Then the police were already there. And have shown him a way out of the tight. He was high (of which intoxicants, he does not want to say), so despite the pain he stayed with his buddies on the Loveparade until late at night. Only through the television crews “who wanted to do interviews”, he had learned of the extent of the disaster. The state of NRW wants to provide a total of 400,000 euros with the budget 2018. 300,000 euros will be donated to the foundation “Duisburg 24.07.2010”, which supports its members psychologically and pastoral during the process with a support team. An amendment to the budget also provides for another € 100,000 to cover part of the accommodation and travel costs of the co-plaintiffs in the process. In the Loveparade trial, other witnesses testified yesterday. They described how they experienced the mass panic and survived. Dusseldorf. How was it then, on July 24, 2010 in the deadly flock of the Love Parade disaster? How could it happen that 21 young people died in Duisburg and more than 650 were injured? The district court of Duisburg yesterday heard two other witnesses who were in the midst of a deadly swarm. Unlike a young woman who testified last week in the large courtroom of the Dusseldorf fair, Gernot B. has come out without injuries and without trauma from the case. Anyway, he says so himself. And he wonders when the judge reads him then from a medical certificate that certifies him definitely a traumatization. Even for the 34-year-old software developer, who went to the Love Parade with some friends, it was life-threatening. When he’s only a few feet from the stairs some people save from the deadly swarm, it’s not back and forth. The Braunschweig describes how he can not move in the confines completely, the left arm down, the right above the head. And so he can not help because next to him hyperventilated a young woman. “Then her eyes were lifeless and turned up,” he says. He was still trying to grab her by the arm, pull her up, but he can not make it, is self-constrained and motionless. The last thing he sees of her is that she sinks between the other people. He never knew what happened to her. “I suspect she died,” he says. At the latest, he realizes that the situation is deadly. “I was worried about my life, but I tried to calm down and not, like some others, try to push me out of the crowd.” At some point there is a push that spreads through the crowd, he and others around him are crooked, his feet still on the ground. Then occasionally people are torn from the crowd, his friend Marco has fainted: “I hit him with a flat hand in the face, he should persevere.” At some point there were many helpers there, he could go up the stairs and later found his friends again. The second witness on this day has a different perspective: The 42-year-old Mehmet B. makes a solid impression at first glance. But in the course of the hearing comes through, how this day has strayed from the track. The professional driver still uses drugs that prohibit him from using machines and driving cars. He had conversation therapies, took antidepressants, the joy of life had been lost to him. He could only help out in the drinking hall today. He blames himself for behaving like that, he says. He also tells of wave movements of the mass, for him the stairs had been like a magnet. A possible escape route. On the way he had “pushed through the crowd with much physical effort”. Everyone was violent, he justifies himself, everyone wanted to save his life. Finally he reached the stairs. A young man wanted to pull him up, but then he let go of his strength and let go. So he was thrown to the ground. Then the police were already there. And showed him a way out of the tight. He was high (exhilarating, he does not want to say), so despite the pain he stayed late at night with his friends at the Love Parade. Only from the TV crews “who wanted to do interviews,” he had learned of the dimensions. What exactly happened during the Love Parade disaster? On the eighth day of the criminal trial, the court questioned a man who survived the crush. A young woman by his side probably not. In the Loveparade trial on Tuesday, an eyewitness of the disaster in Duisburg described how in the crowd next to him a woman was unconscious and sank into the crowd. The young man also acts as a co-plaintiff. He reported how he and another man tried to pull the woman out of the crowd, but failed. Then she stopped breathing and disappeared next to him. Whether she survived, he did not know. The witness reported that he and four friends wanted to visit the Technoparade on the former freight yard. At the foot of the ramp, the only entrance and exit to the venue, they did not get any further. The crowd had finally been so strong that he could no longer lift his left arm up. “I remember that by my side a young man screamed that his girlfriend could not breathe,” he said matter-of-factly. They still tried to pull them out, but they did not make it. “She breathed quickly and then did not breathe.” Then she was lost next to him. “I had the impression that the woman next to me is dying.” From that point on, he had been aware that he, too, could feel the same way. “I did not panic, but I was scared for my life.” He tried to keep a cool head. Later he was pulled out of the crowd and left Duisburg again. He said that he had not been injured and had not gone to see a doctor afterwards. The presiding judge had to inform him then a better: He had been two days after the accident very well with a doctor. However, according to his own statements, the man could not remember this visit to the doctor either. “I think I coped relatively well,” he said. At the Love Parade disaster on July 24, 2010 in Duisburg 21 people were crushed and at least 652 were injured in a crush. The trial before the district court of Duisburg against six employees of the city of Duisburg and four employees of the organizer Lopavent had begun in December. The prosecution accuses them of, among other things, negligent homicide. At the coming trial days, the court wants to question other co-plaintiffs. Because of the many parties involved in the process takes place in a congress hall in Dusseldorf. Kick-off in the process for the Duisburg Love Parade disaster Dusseldorf. In the Loveparade trial on Tuesday, an eyewitness of the disaster in Duisburg described how in the crowd next to him a woman was unconscious and sank into the crowd. The young man also acts as a co-plaintiff. He reported how he and another had tried to pull the woman out of the crowd, but failed. Then she stopped breathing and was lost beside him. Whether she survived, he did not know. The man stated that he had remained unhurt in the crush and had not visited a doctor. However, during the interrogation, the presiding judge stated that the man was at the doctor two days after the accident. At the doctor’s visit, however, the man could not remember even then. At the Loveparade disaster on 24 July 2010 in Duisburg 21 people were crushed and at least 652 injured in a crush. The trial against six employees of the city of Duisburg and four employees of the organizer Lopavent had begun in December. The prosecution accuses them of, among other things, negligent homicide. At the next trial, the court wants to interview further co-plaintiffs as witnesses. The Loveparade trial hears the first witnesses. While a woman describes the experiences with emotional words, video recordings of Manfred B. shock the hall. She fights. With what she has experienced or what has displaced her. And about her composure. Rosalinda B. is the first witness to testify to the 2010 Love Parade more than a month after the criminal trial began. And the first victim to finally speak. On the tragic July 24, 2010 Rosalinda B. drove with her sister to the techno party. By taxi. They came in clean. But when the sister injured herself on a piece of broken glass and the two were looking for a paramedic, they fell into the crowd at the only entrance and exit. “We were pushed from the front and from behind,” says the witness, “like sardines in a tin.” A police cordon tried to sort the crowd, and someone told them to wait until it calmed down, “But it did not calm down.” Only worse. “Hold my hand, do not let go,” yelled the nurse. But the two were separated. Rosalinda, only 1.58 meters tall, struggled for air, saw only upper bodies or backpacks in front of her. A young stranger helped her, holding her head up, pushing toward the small concrete staircase over which people fled the death-trap. Rosalinda B. already crashed on the second level, other fugitives fell on her. Next to her, the witness tells with tears, a young woman lay, who also did not come up. “Please help me,” I have begged half the child, but: “I could not free myself, the people were on me.” And they got heavier and heavier. B. woke up hours later in the hospital, on the stairs she had fainted. The second witness and co-plaintiff will be Manfred B in the afternoon. The 34-year-old teacher staggered on the day of the tragedy, only a few meters away from Rosalinda B. But he has, it will be clear after a few minutes of his interrogation, the misfortune far better overcome. Almost soberly sound the answers of the powerful man, who describes precisely how “from a certain point of time, people had no choice where to go” – and were thrown back and forth by waves of mass. As a “pizza guy”, Manfred B. put a four-part “chronology of a disaster” on Youtube in the summer of 2010. On Thursday, the courtroom will be his auditorium. Suddenly it is dead quiet in the semicircle, defenders as prosecutors staring at the three large screens in the hall. 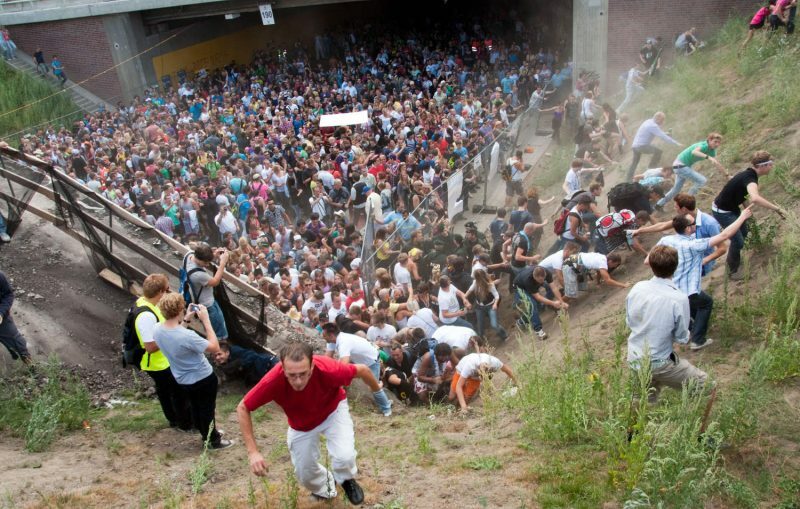 And see in pictures, what is in the files: That on 24 July 2010 at 16:30 clock the situation on the ramp comes to a head, as the first, apparently powerless body, are passed over the crowd to the rescue staircase. And they hear the screams of the crowd shrill: “I do not want more” or “Get us out of here!”. At 4:59 pm of the recording, one hears a woman moan: “I can not do it.” Since that defendant has to drive with his hand over his face, who was then the event manager of the Love Parade. Rosalinda B., the first witness in this mega-trial, left earlier Thursday. The video does not need. She has been in therapeutic treatment for years. She did not suffer any organic damage, but the psychological consequences crush her. During her statement on Thursday, she nervously kneaded her fingers. And sometimes she pressed together a white handkerchief. For example, when she reveals what she still tortures most of all, “I do not know if the girl next to me is alive, or if she died.” Her sister survived. The taking of evidence began in the Love Parade process. The first witness described how she survived in the crush – and that she still has feelings of guilt today. In the Love Parade trial, the first witness reported how she ended up in a deadly crush in Duisburg more than seven years ago. Her sister had injured her hand on a piece of broken glass on the site, reported the 31-year-old apprentice halting and breathing heavily in front of the district court. In the search for medical help, she was then with her sister in the crowd. A chain of police officers had prevented them from leaving the grounds. The chain had then been torn apart and the crowd had increased. Her sister had pleaded: “Hold my hand, do not let go.” But then she was torn away. “The pressure was so strong,” she had lost sight of her sister. She could not breathe, could not move. A young man helped her with her head and hair up, saying, “I’ll help you.” When trying to reach a staircase at the access ramp, but she then fell. People were lying on it. “On my left was a young girl shouting, ‘Help me, help me!’,” Said the witness. But that was not possible. “I could not free myself.” She then woke up in the intensive care unit of a hospital, said the Duisburg. From time to time she still feels “this tremendous pressure,” said the witness. “If I smell something specific or see many people, that will come back.” One year after the disaster, she had been in a psychosomatic clinic for seven weeks. She still felt guilty because she could not help the young woman next to her. What became of her is not known. The witness’s sister survived. With the testimony of the witness, the court now entered the evidence. At the Love Parade disaster on 24 July 2010, 21 people were crushed and at least 652 were injured in the dense crowd at the only entrance and exit. Due to negligent homicide and negligence, six employees of the city of Duisburg and four employees of the organizer Lopavent are charged. The process started in December (the most important questions and answers can be found here). For reasons of space, the procedure of the Duisburg district court takes place in the Düsseldorf trade fair. Rosalinda B. crashed and was traumatized. Manfred B. documented the events in the deadly scrum. As witnesses, they reported on the process of witnessing the 2010 Loveparade. Andrea Grunau from Dusseldorf. “Help, get us out of here !! !” The 7th day of negotiations in the Loveparade trial is almost over, screams of pain and shrill cries for help ring through the courtroom in the Düsseldorf Congress Hall. On three large screens, the district court Duisburg shows videos titled “Chronology of a Disaster – Part 1 to 4”. One sees in it, how humans, who want to celebrate at first cheerfully, evidently in fear of death try to flee from the unbearably close trap between a high wall, an embankment and urgent people in tunnel entrances. A few escaped via a narrow staircase, bodies are repeatedly passed over the heads of others, others climb over their heads themselves. The performance lasts nearly 40 minutes: screams and noise change with silence when photos are displayed. Manfred B. makes it clear on text panels that he was lucky because he is 1.90 meters tall and strong. In the crush, he almost strangled someone because his elbow pressed against his neck. He could have pulled off his arm, but he could not have avoided evading anyone under him. After the last video, there is a moment of deep silence over the large courtroom. You can hear the humming of the air conditioning and your own heartbeat, which has noticeably accelerated. With the beginning of evidence, the process now focuses on the horror experienced by visitors to the Love Parade, when many struggled for their lives in a confined space. On July 24, 2010, 21 people were killed and at least 652 injured. The first days of the trial had mainly influenced requests from the defense. They emphasized recently that their clients – employees of the city of Duisburg and staff of the organizer Lopavent – are only “suspects from the second row”, the “fake in the dock”. Above all, the police would “kept out of responsibility”. The charge is for negligent homicide and negligent assault. Rosalinda B. was injured and traumatized. “The air was squeezed, we were pushed from the front and the back, like sardines in the tin,” Rosalinda B. delves into her memories when she reports at noon as a witness in the Loveparade trial. The 31-year-old from Duisburg starts hesitating, looks at her hands, rubs her fingers again and again. “Nobody is doing anything here”, Judge Plein tries to reassure her. Her older sister Giusi had injured her hand on the way to the festival site, she says. To look for paramedics, the young women were reversed and rushed into the crowd. A police cordon would have blocked their way. “Do not let go of my hand,” her sister had said, but they had been scattered as well as the police cordon. “I felt as if I had been the smallest, there were only upper body and backpacks,” Rosalinda B. reminds herself: “I could not breathe.” A young man tried to help her, but she fell at the bottom of the stairs. “Next to me lay a young girl,” she keeps telling her that she asked for help, Rosalinda B. puts her hands over her face: “But I could not help it, because people could not help me It was getting heavier and heavier. ” The witness is tormented and close to tears: “I do not know if the girl survived, I’ve felt guilty for seven years,” she says. “Only those who have gone through that can understand that.” Lawyer Julius Reiter, whose law firm represents about 100 co-plaintiffs and Loveparade-injured, knows such “survival guilt feelings” also from his clients, he reports the DW. Rosalinda B. became unconscious, woke up only in the ICU in the hospital, she was ventilated. The doctors diagnosed a massive breast squeeze, a thoracic trauma, bruises, a mental shock. She was in great pain. Weeks of hospitalization followed to treat her traumatization. Until last year, she was unable to work, says the 31-year-old, now she is training in nursing. If she remembers back then, she still feels “this tremendous pressure” today. When the life-threatening crush on the Loveparade in Duisburg came to an end, there were two lifeless bodies right in front of him, reports Manfred B. Sachlich, as he tried to reanimate her with mouth-to-mouth resuscitation. A police officer had helped him until paramedics had taken over, in both cases in vain. He remembers the colors of the garments: pink and green. When there was nothing left to do he went up the stairs. Until the evening he stayed at the festival area, where many ravers were celebrating who did not know what had happened. “That was very surreal, I walked like a zombie,” says the prospective teacher. “I’m not a hero,” Manfred B. wrote as a text in his video. In the throng he had tried to help a young woman who was depressed on the floor among many others. “We come out of here”, you can hear him say in the video. He asked her to fight, not to give up. He held her hand. In 2010 he was honored together with other private helpers by Federal President Christian Wulff. Through his videos he found the girl whose hand he had held. In December 2010 he was invited to a talk show with her. For traumatized witnesses it will be very difficult to remember details that contribute to further education, defender Kerstin Stirner suspects. Rosalinda B. also testified that she had tried to oust a lot, she even moved away from Duisburg. “All the more important are people like the second witness, who made such a solid impression that he might be able to give a more detailed impression of the events, so this witness should be interviewed even more intensively later,” Stirner told DW. From the point of view of the defense, it was of interest “whether and how individuals perceived the events on the day of the event, in particular, of course, the police chains and their immediately noticeable consequences”. This is important for “the question of the causality of individual circumstances for the tragedy”. The interrogation of Manfred B. was interrupted and will continue next week. Yes, he seems stable, but when presiding judge Mario Plein asks him how he mentally coped with the events, he is silent first. Then he tells of sadness and that he “had to cry a lot”. Even if he could work and go back to the disco, if he was interviewed and dealt with the Love Parade as now for the process, then he noticed internally “a lot of sadness”.